James recently completed 'Network' - a major commission by Arvato Finance. The feature included an in-depth interview regarding current work practices, including sculptures. 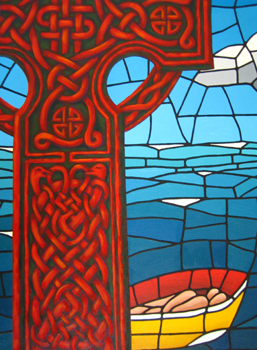 'Celtic Crossings' a major commission for The Sweeney Agency in Toronto. The large format painting in oils on canvas invokes Celtic motifs, reflecting the historical and current business connections between The Sweeney Agency and Ireland. Exhibition: 'Departures' at the Red Stables. 'Intranet': a major commission for WEEE Recycle. This large format piece incorporates over 40 microchips with miniature figures. Exhibition: 'Evolution' at The Old Market House Arts Centre, Co. Waterford, . James was selected to participate in 'Water Ways' at the Lavit Gallery, Cork, as part of the festivities for Cork's European Capital of Culture programme. Exhibition: '2x2' at Ardgillan Castle. Exhibition: 'Tripartite' at The Bank of Ireland Arts Centre. James completed a major commission for Connect Electronics. 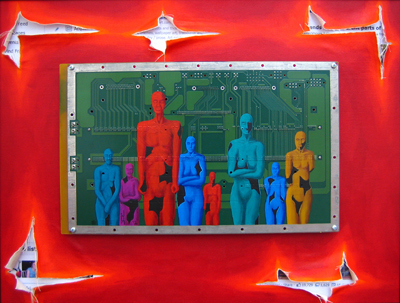 This included 6 technology based paintings for their Dublin and Florida offices. James was commissioned to complete a PCB painting for Post Consult International, a member of the An Post Group. Post Consult International reception area featuring 'NET' and 'WAN' by James Quinn. James completed a commission to mark the Millennium for CAP GEMINI Ireland. COMPUTER PARTS INTERNATIONAL PLC, Nottingham, commissioned James to produce two major works during 1999. CPI are the largest independent distributors of IBM spares in Europe and have recently relocated to custom built facilities in Nottingham. James has completed large PCB paintings for their reception area and conference room. Doug Ashby, CPI Chief Executive and Managing Director described the finished paintings as "fantastic", while Helen Clark (Project Manager for the commission) said "the paintings are tremendous, a real conversation piece."